UNITED NATIONS, August 25, updated Aug. 27, 9 pm -- Alan Doss, the Special Representative of UN Secretary General Ban Ki-moon in the Congo, is embroiled in a nepotism scandal at UNDP in New York. Meanwhile in Kinshasa, he has barred Guershom Nondo, the president of the MONUC staff union, from UN premises. When on August 25 the Staff Union in New York sought to solve this labor problem, they were first told that the head of Peacekeeping's Department of Field Support is away from New York. Her deputy, Tony Banbury, was deemed too busy with other meetings to attend to this problem in the Congo. Finally a lower ranking official said that the "Special Representative" -- that is, Alan Doss -- would surely take care of the problem. But how can the UN preach good governance, transparency and labor rights, particularly in the Congo, when the chief of its mission there explicitly asked the UN Development Program to bend its rules -- show him "leeway" -- and give his daughter the job of the assistant to the Deputy Director of UNDP's Regional Bureau for Asia and the Pacific, who was subsequently pepper sprayed by UN Security after he displayed Doss' email asking for "leeway." He then allegedly bit Security Office Peter Kolonias, but that's another story. 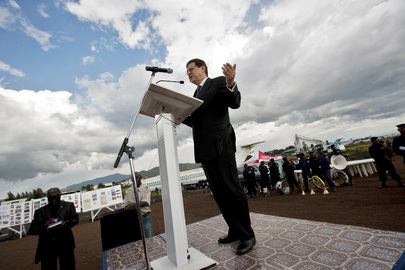 UN's Alan Doss in Goma -- preaching? And here is another story: a UN whistleblower who served in Liberia says that while it is a non-family duty station, Doss brought family members there, something prohibited to other UN staff, and tried to get them hired, for example by UN Volunteers. Inner City Press has been told this by several well-placed sources. The UN has still refused to answer questions posed in writing on August 14 to Ban's Spokesperson's Office and August 14 to Peacekeeping, "Please describe and account for -- including use of UN / Mission resources including air resources -- any presence by Doss family members along with Mr. Doss in DRC, and before that in Liberia (for that latter, including any effort to use UN Volunteers resources)." For seven and ten days, no answers from the UN. Inner City Press has asked Doss for his side the the story and received a terse email that he began at DPKO on July 1, the rest is being investigated. Inner City Press: Marie had said … now it’s, I don’t know, about 10 days ago … that the Secretary-General took these allegations about Mr. Doss, the job that UNDP -- the whole nepotism issue seriously, and he expected to receive a report on his return to New York. I am wondering, has he received this report yet? And if not, when is he going to receive it? Spokesperson: Well, you know, I asked the question today and the answer I got is that he has not received the report yet, and is still expecting it from UNDP. Inner City Press: Because, the thing is, when she said it, she said it was somehow different than the UNDP one. She said he expected to receive it upon his return to New York. That’s why it sort of seemed to be maybe just an update on what had had happened, or why the investigation is taking so long. Spokesperson: As far as I know, he has received nothing new about the case. And on August 27, Ban Ki-moon leaves town again, for Vienna and Norway and Geneva. His Deputy Spokesperson said he took allegations of nepotism seriously and expected to receive a report when he returned to New York... Watch this site. Update of August 27, 11 am -- for the record, Alan Doss' MONUC now states that "Mr. Nondo has neither been banned from MONUC premises, nor suspended." That's not what Mr. Nondo's email to UN Headquarters in New York has said. We note the UN's strange position on putting actual documents online, that it is somehow undiplomatic. We also note that the UN and DPKO have refused, since August 14 and 17 respectively, to provide any answer to whether Alan Doss has used UN resources for his family in his previous "non-family" post in Liberia. There are a number of other questions left unanswered by the UN and DPKO, we will be writing separately on that topics shortly. Watch this site. Dear Matthew, Your report regarding MONUC and Mr. Nondo was incorrect. MONUC informs that Mr. Nondo has neither been banned from MONUC premises, nor suspended. "Please be advised that starting this morning I am not allowed to enter MONUC premises... MONUC administration has decided to put me in administrative leave starting this morning until further notice. This decision is related to ... the ongoing interim Salary Survey as well as all similar activities." Inner City Press asked the UN Spokesperson's office, which erroneous charged error, for a response, even suggesting they seek one from DFS Officer in Charge Tony Banbury, but none has been received. Banbury has been aware from the first article that the issue is being raised. Is the claim, as with the UNDP worker whose job Doss stole for his daughter, that the lower ranked staff member is lying? How low will the UN go? How much abuse of power will be permitted? Watch this site.